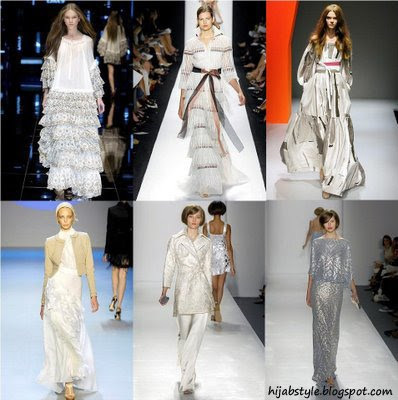 My second installment of the Spring 2008 RTW sees plenty of long, floaty dresses and luxe fabrics. Ruffles and tiers are key in this season's romantic trend, as seen at D&G and Carolina Herrera. DKNY showcased a more graphic print dress, but billowing skirts and sleeves gave it a softer feel. Zac Posen chose to add neutral accessories (including interesting headgear) to his white maxi dress. Is this a look that's going to take off? I would wear the third and the fifth outfit with hijab. I like the third one a lottt! Nice pictures. The dresses are a bit fussy, but the jackets in pic 4and 5 are lovely.